Growing wine is ill suited to those seeking instant gratification. We planted the Alpine and Horseshoe Vineyards based on a well-informed, but quite unproven belief that these sites held the potential to produce world class Pinot Noir. As we’ve raised these vines into adulthood, we feel we’ve been able to make extremely high quality Pinot Noirs that deeply reflect their sites. 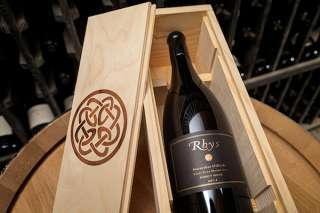 We’ve always known, however, that the potential for an unparalleled wine existed in the finest blocks at both vineyards. In 2014 we realized that potential for only the second time, and we’re thrilled to be able to produce and release these wines that show the ultimate capability of these sites. 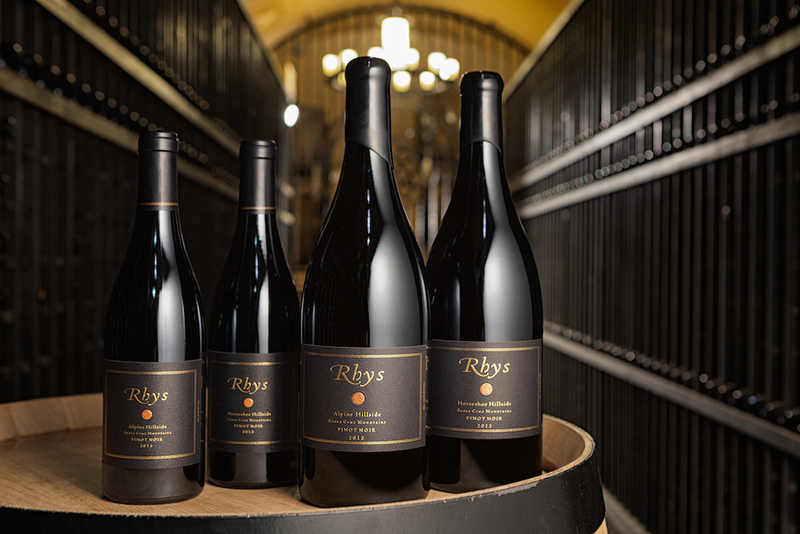 The Rhys Hillside Pinot Noirs capture the pinnacle expression of our iconic Alpine and Horseshoe vineyards. The last decade taught us that a few blocks within these sites consistently produce even higher quality wines than their neighbors. The high variability in yields from these mountain vineyards often means we do not have enough production to even consider a Hillside cuvee, the 2015 vintage is a excellent example of not having enough. The third year of California’s enduring drought brought us another consistently warm growing season and early harvest. The mild ocean temperatures that accompany “El Nino” conditions kept the vineyards two to three degrees above average for the entire season. Importantly, the steady, accumulated warmth occurred with few prolonged heat spikes. The 2013 vintage was quite similar, but 2014 was differentiated by a third straight year of scarce rainfall, furthering the severity of dry soil conditions. Given the lack of water, our grapevines set a moderately sized crop, smaller than either 2012 or 2013, with thick skins, loose clusters and many “hens and chicks” meaning a mixture of berry sizes. This combination gave the wines deep concentration with excellent structure and balance, easily meeting the criteria for a Hillside bottling. John Gilman, View From the Cellar (July-August 2016, No 64) The 2014 is the second vintage of the “Horseshoe Hillside” reserve bottling from Rhys Vineyards. The wine is once again a brilliant young pinot noir, offering up again stunning precision and nascent complexity on both the nose and palate. The very promising bouquet wafts from the glass in a blend of black cherries, dark berries, raw cocoa, a bit of gamebird, lovely, discreet spice tones, a fine signature of soil, still a bit of youthful stem tones and a discreet base of spicy oak. On the palate the wine is full-bodied, pure and transparent, with a superb core, exceptional focus and balance, fine-grained tannins, bright acids and outstanding length and grip on the youthful, but stunning finish. This is an absolutely exceptional young bottle of pinot noir and is a fine, fine follow-up to the magical 2013 version. 2024-2060+. 96. Antonio Galloni, Vinous Media (July 2016) The 2014 Pinot Noir Horseshoe Vineyard Hillside is one of the most explosive wines in the lineup and yet there is also plenty of fruit to match the wine’s overall intensity. Dark cherry, plum and spice notes struggle to emerge. Today, the Horseshoe is embryonic. What stands out most is the wine’s depth and overall textural feel. A closing kick of brightness adds energy. 96. Jeb Dunnuck, Wine Advocate, Another straight up gorgeous red is the 2014 Pinot Noir Horseshoe Vineyard Hillside, and it’s possibly the wine of the vintage. Having said that, it’s certainly not for those looking for instant gratification. More focused, mineral-laced and masculine than the Alpine Vineyard, with lots of crushed rocks, smoked black fruits, black cherries, leather and peppery herbs, it has fabulous purity and precision on the palate, with tight-grained tannin, impeccable balance and a great finish. It needs 4-6 years of cellaring and will have two decades or more of longevity. 96+. 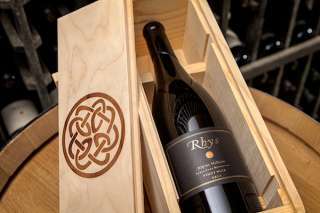 John Gilman, View From the Cellar (July-August 2016, No 64) The 2014 Alpine Hillside bottling of pinot noir from Rhys Vineyards is once again my favorite of this absolutely stellar roster of 2014 pinots from this great Santa Cruz Mountain property. The wine offers up a marvelous nose of black plums, black cherries, espresso, woodsmoke, black minerality, fresh thyme and cedary wood. On the palate the wine is pure, fullbodied, focused and tightly-knit, with a marvelous core, great mineral drive, bright acids and outstanding length and grip on the ripely tannic and laser-like finish. At this point in its evolution, this does not seem quite as magical as the 2013, but this should not take away from the sheer brilliance this wine will deliver when it is fully mature. 2024-2060+. 96+. Jeb Dunnuck, Wine Advocate, While there won’t be a 2015 released due to dismal yields, the 2014 Pinot Noir Alpine Vineyard Hillside is an utterly profound wine. Tasting just like the straight Alpine Vineyard Pinot Noir, only more tannic and structured, this beauty boasts awesome notes of black raspberries, spring flowers, baking spices and crushed rocks, with a tight, backwards, concentrated style on the palate. It desperately needs 3-4 years of cellaring, but is a tour de force in Pinot Noir from California! 95+.